01182013_Becherer_IraqMedical020: Doctors of War: Casualties of War: Global News Portfolio: New Orleans based Photojournalist covering the Deep South and beyond. 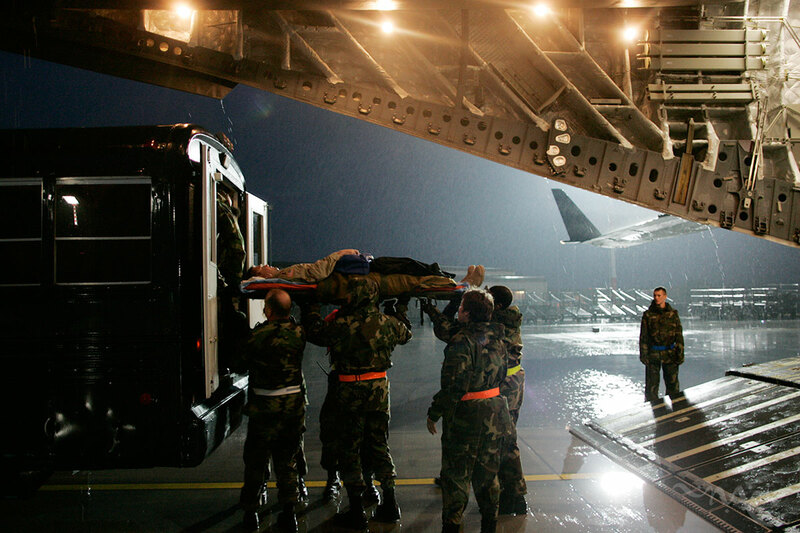 A wounded soldier is carried off of a C-17 aircraft to a rainy flight line at Ramstein Air Base after taking a five-hour flight from Iraq. Soldiers are transported on a C-17 plane from Iraq to Ramstein Air Force Base in Germany. The wounded are then transported to buses and driven to the Landstuhl Regional Medical Center where their wounds will be further repaired, cleaned and treated. By the time the wounded reach Germany they face mainly operations of recovery as opposed to life saving operations.